eMarketer reports that men are online more often, but women stay longer. 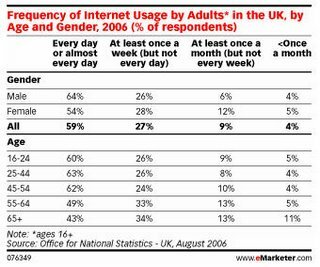 Women ages 18 to 34 account for 27% more of total time spent online in the UK than men their same age, according to Nielsen//NetRatings data released in May 2007. The ONS data indicate that despite the frequency of their online visits, men do not spend as much time during those visits as women.